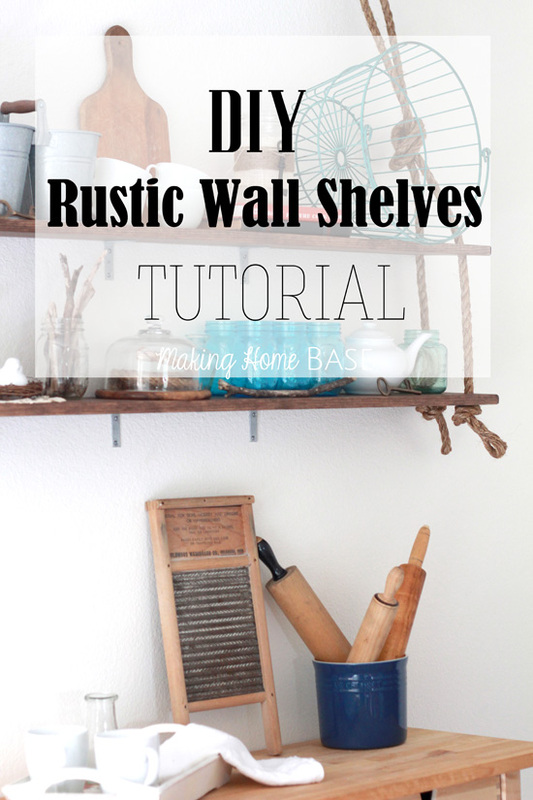 Earlier this week I revealed my Rustic Wall Shelving. 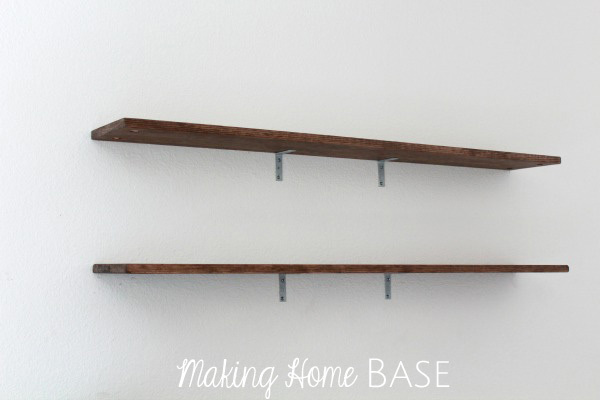 My husband and I had such great time creating these shelves and it was amazing how easily they came together. 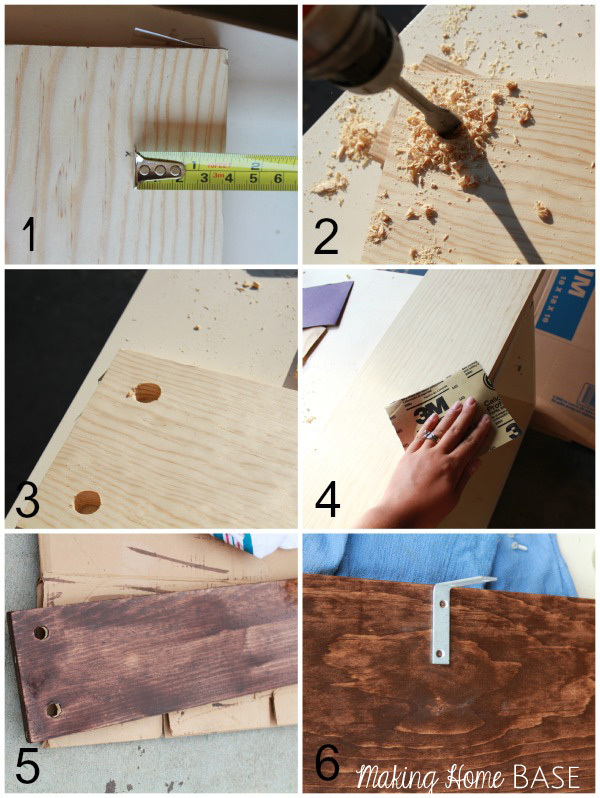 As promised, I’ve put together this wall shelving tutorial for you guys. And if you love them, I encourage you to pin this post and give them a shot! 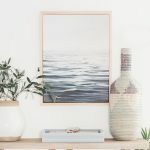 As a renter, I’m ALWAYS looking for options to fill up blank walls. I shared a collection of awesome temporary wall treatments recently, and this one can be added to the list: wall shelving! 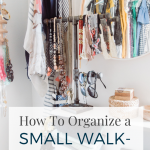 It’s a great way to bring attention to you beautiful styling instead of the stark white wall. That being said, unique shelving is always more fun. So in the interest of thinking outside the box, this is what we came up! 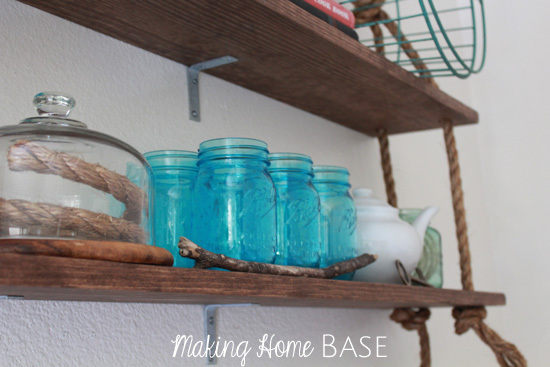 Let’s hop into the Rustic Wall Shelving Tutorial. 1. Measure and mark where you want the holes for the rope. For me, it 1.5″ from the edges of the board. 2. Drill your holes with a 3/4″ paddle drill bit (I absolutely loved this part. Super easy and created the perfect sized hole). 4. Sand the board. Make sure to get around the rope holes and the edges. Wipe down your boards really well to prepare for staining. 5. We stained our board using Mixwax’s Special Walnut. This is probably my favorite stain color ever. 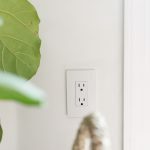 I know it’s personal taste, but it works really well in my house and we’ve used it on multiple projects! 6. Place and attached your shelving braces (we used corner braces instead of actual shelving brackets). Once the shelves were dry we were ready to hang them. Unfortunately the studs on this wall wouldn’t allow us to center the shelves so instead we decided to use wall anchors. To level the shelves we centered them, then screwed in the first bracket – used a level to get the shelf straight then screwed in the second bracket. For the rope: We used these larger hook screws to hang our rope. Since the rope is only for aesthetics, we were able to use these hook screws are not worry about the weight of the shelves. The shelves are sturdily in place because of the braces. For the knots: I took one piece of rope 6 feet long and folded it in half. Then tied a knot about a foot down from the fold. 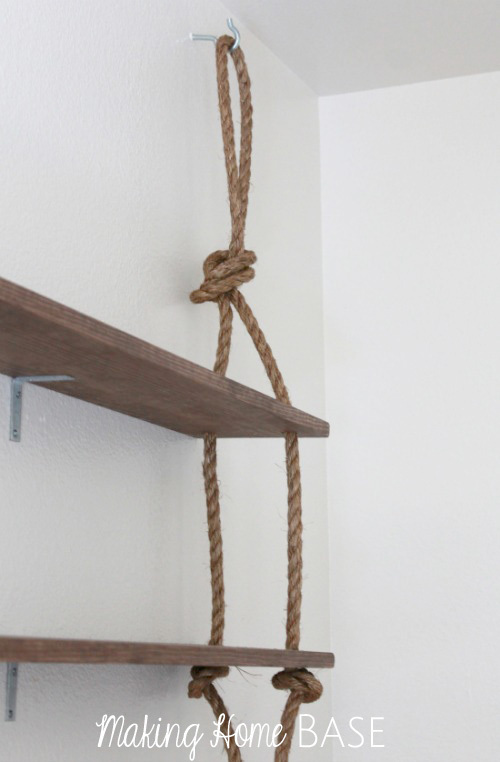 Then I threaded the rope through each of the holes and tied another knot at the bottom of the second shelf. The last (and the most fun) thing to do is style your shelves! 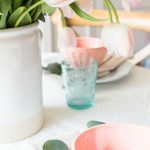 Mine are hanging in my dining room which is the perfect place to show off all of my thrifted, vintage, and just pretty kitchen items. There you have it! 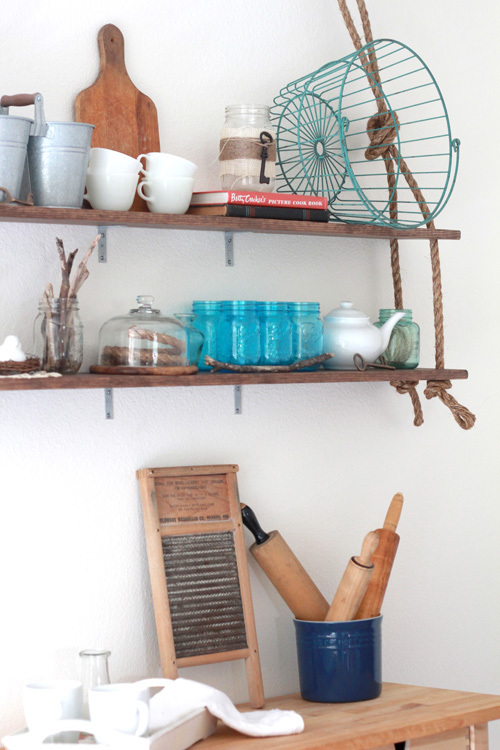 I hope you enjoyed this rustic wall shelving tutorial. Please if you have any questions write me a comment or shoot me an email. I’ll be glad to help! Love your shelving unit Chelsea. They look really nice. It is hard living in rentals when you’re a busy crafter. Hard to hold back on all the projects you’d do if you could. Our kids (4) were older before we finally were able to buy our first place and I sure loved being able to do what I wanted in our home. We did a lot of painting in homes that weren’t ours. These are great Chelsea! You know I love me some rustic greatness! Chelsea – This looks amazing! I have an outdoor picnic area that is decorated with a nautical theme and this would be perfect next to our BBQ for holding supplies. Thank you so much for the great tutorial. Blessings to you and your husband for service to our great nation. Love it, Chels! So cute and creative! I love this! You’re quite the inspiration, and I love your Mason jars! One additional thing I plan to do is to paint the wall anchors and hook (white & stain shade) to blend in better with the walls and shelf. Great job and I can’t wait to copy! These are great ideas. The only problem is most apartment complexes won’t allow renters to put very many holes in the walls, especially large ones. I tried to hang a framed family photo that required nails and the managers were very upset by this. I had to pay for the “damages”. I recently moved to a small apartment and had to give away a lot of my furniture. 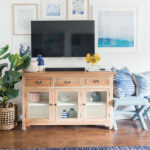 Do you have any suggestions on shelving that don’t require nails and brackets? Even if they are small shelves for knick knacks, I haven’t been able to find any. Thanks for the suggestions on wall decorating. I’m going to cover my ugly large closet doors.